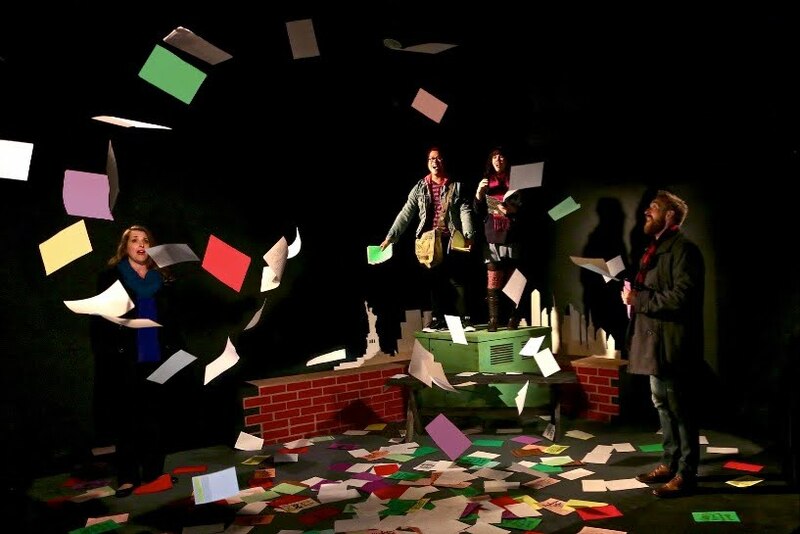 “Ordinary Days’ by Adam Gwon, is not an ordinary musical. According to composer/lyricist/ and everything in between, Gwon describes his piece as a ‘through sung musical’, ‘a narrative musical’ with ‘story songs’. And he’s right, of course! Yours truly considers it a chamber piece and all of the above. “Ordinary Days” under the direction of Matthew C. Graber, now on stage at InnerMission Productions located just behind the space that Diversionary Theatre occupies, will be playing through Aug 12th. It’s a relatively small musical, by musical theater standards. Some liken it to “The Last Five Years” by Jason Robert Brown seen recently on Ion’s stage that had two characters. In both a story is told through the characters’ experiences and perspectives in their every day lives. “Ordinary Days” has four characters and details the vicissitudes each one living in New York City, the city that never sleeps, experiences while real life around them is happening. ‘Five Years’ is more of a love affair gone badly, in retrospect. 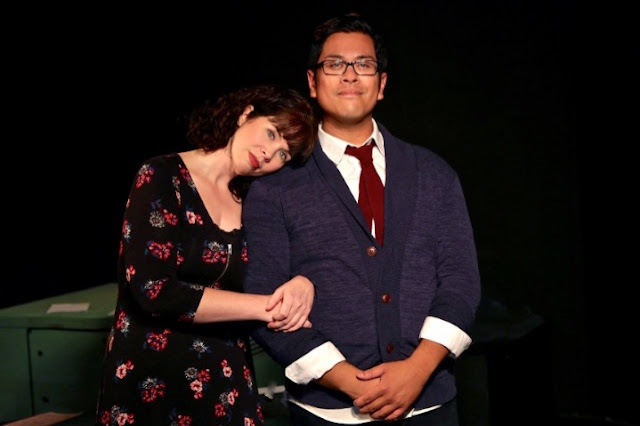 “Ordinary Days” premiered in 2012 and has been making the rounds almost every year in theatres across the country since and now audiences in San Diego are the recipients of InnerMissions first musical and west coast premiere of this appealing work. Lucky for us as Gwon’s musical is a charming piece, albeit somewhat contrived as in the Clair/Jason relationship that is suspiciously predictable. The Warren and Deb pair adds humor both in personality and nature of their predicaments; so real to life on so many levels. I remember as a younger version of myself on trips to New York for theatre and visiting friends that it was always a ‘place I loved to visit, but not a place I would love to live’. 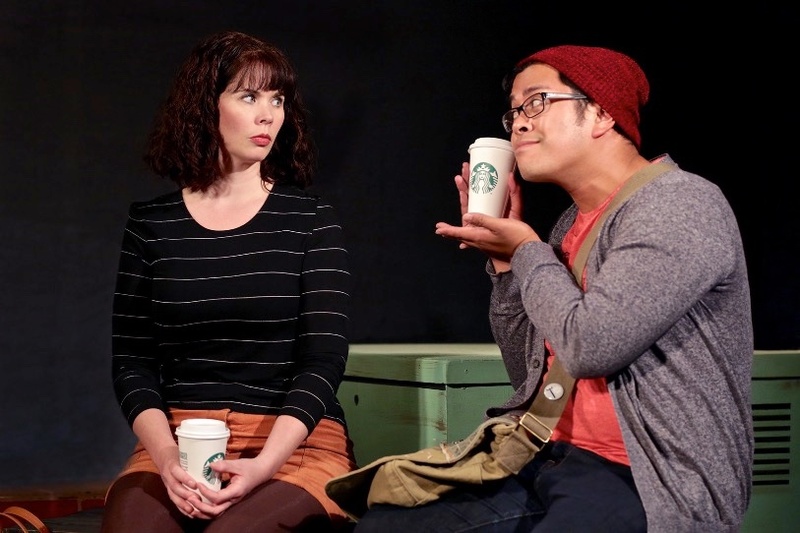 In a series of short vignette’s Clair (Kym Pappas), Jason (Brent Roberts), Deb (Jamie Channell Guzman) and Warren (Patrick Mayuyu) (“One By One”), mostly outsiders looking for some companionship, connection and or stability in their lives, cross paths in some of the most unusual ways. Mid 30’s Claire and Jason are about to move in together (both navigating sets of belongings into one small space brought back memories of dorm living). “The Space Between” tells of how easy Jason thought the move in would be, (there were fourteen blocks between her place and mine’). He’s ready, we think, for this romance to take off. She, on the other hand (“Let Things Go” -‘you’ve got out -of –date planners and dog eared postcards’) isn’t quite so sure. Twenty something Deb (“Don’t Wanna Be Here”) is a transplant from a place ‘in the middle of nowhere…my hometown was like a suburb of a suburb…I actually lived on a cul-de-sac…that’s the definition of a dead end”. When she finally ends up in New York, she doesn’t want to be there either. Now she is in grad school after dropping out of grad school in her hometown, reading Virginia Wolf (“Dear Professor Thompson”) and working on her PhD Thesis. To Warren ‘the city tends to make him invisible’. He’s house and cat sitting for an artist friend…who got arrested for painting ‘pithy sayings across the city’. To him it’s just “Another day out in the metropolis” as he hands out flyers ‘with sayings that his painter friend painted on the sidewalks and walls of buildings. Some call that graffiti. Warren also collects bits and pieces of the city that others have either discarded or lost. (”Life Story”) And that brings us to the Deb and Warren connection. Deb misplaced her composition/hand-bound book with all her thesis notes in it; long Xerox scraps ‘that drips with old school flair’. You guessed it. Warren found it in Union Station. After looking through it he noticed that the last entry was that day’s date and for good measure an email address. In one of the funniest segments after contacting Deb about her binder, Warren suggests they meet at The Metropolitan Museum (“Saturday at the Met”) “in room twenty-one there’s a landscape by Monet”. There he will hand off the notebook. After bragging about her ‘irrefutable sense of direction’: “I don’t understand why I can’t find my way through the fu**ing Metropolitan Museum”. It goes downhill from there in a series of wrong turns, confusing artists; “Monet?” “Manet.” Finally, they accidentally find each other almost tripping over one an other. In the meantime Jason and Clair are also at the museum but find themselves in different sections complicating their relationship even further. “He likes the masters.” “I prefer wackier things”. Throughout the piece, while the couples crisscross each other, they never meet, nor are they seen together except for the final “Rooftop Duet”. All four experienced actors take their turns revealing their innermost thoughts, ambitions and emotional upheavals to the tunes of Gwon'smusic. Ms. Guzman has the more difficult of Gwon’s music as she navigates his story songs and patter music in what some might compare to Stephen Sondheim’s dialogue music. Some of the lyrics are difficult to follow but you get the picture. Her timing is near perfect in spite of oft times playing catch-up with the piano, yet her penchant (facial expressions) for comedy rings true. She is the cynic of the four, but fun to watch, none the less. Both she and Mayuyu are the engaging and fun to be with couple. Robert ‘s tenor voice is the most pleasant of the foursome as he tries to make sense of Clair’s moods. They too wind their way through a more down than up relationship. “Favorite Places” tells the story that his favorite places are the places he’s never been. “All of my most favorite places are places I’ve never been.) That song resonated with me. Kym Pappas’ Claire is the independent single that wants things her way as she surfaces to be the alpha in that relationship. It takes a while but the chemistry does begin to flow after a comeback between the two hits a more conciliatory, emotional and meaningful turn in “I’ll Be Here”, reaching back to the horrors of 9/11and a loss she suffered then. It's a heartbreaking tune and done especially well by Pappas. Hats off to both songster Gwon and director Graber. Gwon’s music with Hazel Friedman, musical director on keyboards coaxing the best out of her singer/actors, and lyrics, while not rhyming but certainly original, addresses the now in terms of reality rather than fantasy. Graber manages to keep the production moving along at a reasonable pace, coming in at ninety or so minutes. A bit more tightening will come as the show settles in. For some light, and a thoughtful night of musical stories aimed at entertaining without drowning in sentimentality Gwon’s “Ordinary Days” taps into a different genre aimed at telling it like it is.